I’ve been thinking quite a bit about what my next art project should be. With Shelter in Place shipped and selling, freelance projects completed, the art for Velociraptor! Cannibalism! moving well, there isn’t much on my art plate right now. Sure, I’ve got some fun projects I’m working on with Galileo Games, but that’s the organization of other people’s work, not my own. So I’ve been thinking a lot about what comes next for me. I have a great many projects that I’ve toyed with, from giant sweeping photo projects that would take a large cast and support group, to novels, to short story compilations to photo books, there are a lot of projects that interest me. It’s easy to say: Just do what you love. But what if you love a great many things? What if you would also like to make something that people want to buy? This means making some choices about what to do and what will be received well enough so that I can do the next project, and the next. I once went to a panel where an agent was talking about working with writers on their projects. She talked about how she responds if a writer says this, “I have an idea for a high fantasy novel and a cyberpunk novel, which should I work on?” If she knows that publishers have been asking about high fantasy, she’s going to encourage the writer to bang out that high fantasy novel. I’ve been thinking of that place, the place where the things you love and the things your audience love, as THE MAGIC ZONE. It’s not where you give up what you love to do what other people want. It’s where you look at what you love to do and what people have loved, then do the thing you all agree is fun. When I ask: Hey, what do you like that I’ve done? 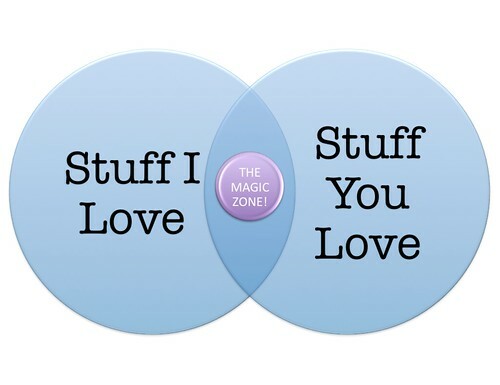 I’m not saying that I am going to bend to someones will, or give up my own vision or never do the stuff that doesn’t have overlap (or where the audience isn’t obvious) I’m just asking where we agree, that Magic Zone where we’re both happy. Of course, figuring out what’s in that Magic Zone, that’s the hard part.